Solo episode, chatting about EVERYTHING, including how I keto, my tattoos, dreams, motivation, and so much more! It’s been a good while since I’ve done a solo episode, and I’m excited to be able to start a conversation with this community again; you had lots of questions, I have lots of answers! It was so fun to be able to get some insight into what you wanted to know, and you guys didn’t disappoint with the content — there were some really good questions that made me pause and think. I hope you enjoy this episode — it’s kind of like we got to hang out together … across the miles … through time … yep, we’re totally BFFs now. Let’s get matching bacon tattoos! In today’s podcast, I’m chatting with YOU! Answering your most asked questions about how I keto, my personal life, and my hopes and dreams. Get Fat Fueled and heal your body with keto! Each scoop of Keto Collagen has 5 grams of MCT oil powder and 10 grams of USA-raised grass-fed collagen, sweetened with stevia with a little cacao powder sprinkled in. Keto Collagen is great added to your daily coffee and a fabulous travel companion. Use Perfect Keto coupon code HEALTHFUL at checkout for 15% off. 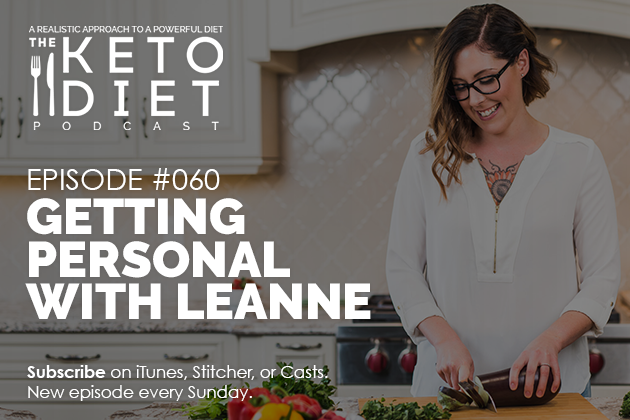 Leanne Vogel: You’re listening to Episode Number 60 of The Keto Diet Podcast. Today we’re answering your questions about … everything, so stay tuned! Hey, I’m Leanne from HealthfulPursuit.com, and this is The Keto Diet Podcast where we’re busting through the restrictive mentality of the traditional ketogenic diet to uncover the life you crave. What’s keto? Keto is a low carb, high fat diet, where we’re switching from a sugar burning state to become fat-burning machines. One of the most challenging parts of starting a ketogenic diet is, well, starting it; and, maintaining it, by preparing healthful, high fat food that tastes good and is easy to make. Part of the struggle is figuring out what to eat, when to eat it, and how much. Did you know that I prepare weekly keto meal plans, and deliver them to inboxes everywhere? Yep! Balanced Keto is a meal plan program that delivers simple keto recipes, shopping lists, and everything you need to chow down on keto week in and week out. 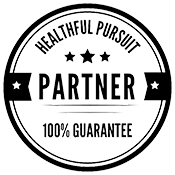 Get more information at HealthfulPursuit.com/mealplan, plus there’s a free 7-day keto meal plan on that page for you to give it a whirl before you jump in. Hey, guys. Happy Sunday. The show notes and full transcript for today’s episode can be found at HealthfulPursuit.com/podcast/e60. The transcript is added to the post about 3-5 days following the initial air date of this episode. Let’s hear from one of our awesome partners. I got one announcement for you guys today. The partners of this episode help pay for the cost of running the podcast: our editors, recording equipment, transcriptions, podcast manager, quality assurance manager, and more. Without the partners of the podcast, there would probably be no show, because it’s a huge undertaking. All the partners of the podcast, blog, YouTube channel, and anything I put out there are brands that I know, love, and think you would benefit from, too. I’ll never, ever, ever partner with a brand that I don’t totally adore. So when you hear this music … it alerts you that an ad is coming. I try to coordinate offers that everyone will enjoy. I hope you’re loving the offers that suit you, and see that all of this free content we put together every week, partners make up just a very small percentage of that. Much are there just to benefit you guys, and to give you other options of how you can manage your ketogenic diet. We get a lot of questions about partners, so I thought it would be a good reminder of why the partners are on the podcast, why we choose to have partners; it’s just a huge undertaking, this podcast thing. It’s Episode 60. I’m here in beautiful, beautiful Oregon, right on the coast in a place called Oceanside. I’m hanging out in a hotel room by myself. It’s a gorgeous little place, I can see the ocean. It’s crazy amazing here, and I just figured, “Why don’t we just all hang out?” And, I’ll answer your questions. The fun part is, I have not seen these questions. Our podcast manager put things together, I have never read them. So, if my reaction is a little bit taken back on some, it’s only because I have never read these questions. So, let’s get started. 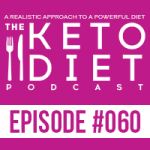 The Keto Diet Podcast, including show notes and links, provides information and respect to healthy living, recipes, nutrition, and diet, and is intended for informational purposes only. The information provided is not a substitute for medical advice, diagnosis, or treatment, nor is it to be construed as such. We cannot guarantee that the information provided on The Keto Diet Podcast reflects the most up to date medical research. Information is provided without any representations or warranties of any kind. Please consult a qualified physician for medical advice, and always seek the advice of a qualified health care provider, with any questions you may have regarding your health and nutrition program. The first group of questions is focused on becoming keto and health on keto. First question: Do you stay 100% keto? Do you make sure your carbs are 5% of your diet? Have you ever fallen off the wagon after a vacation? Awesome question. I wouldn’t consider myself to be 100% keto, 100% of the time. I think if I thought that 100% of the time, I’d probably not be 100% keto, because I’d be so stressed about being 100% keto that I’d be like 80% keto, and then be stressed and angry at myself for being 80%. So, to answer your question, I don’t consider myself to be 100% keto, because I think it would totally stress me out. And, do I make sure that my carbs are 5% of my diet? No, I ain’t got time for that. Basically, when I wake up in the morning and I get hungry, I think, “How can I eat as much fat as possible with as little carbohydrates as possible, while also paying attention to nutrients?” And then, I make myself food. Lately, it’s been a lot of bone broth with fat in it, or decaf coffee with fat in it. Sometimes I’m just too lazy to make an actual rocket fuel latte because it requires the Vitamix. Since moving into our RV and living in an RV full-time, it’s just … taking out the Vitamix, plus blending, plus then cleaning the Vitamix, it just feels like a lot of work. So, instead, I’ve been brewing my coffee by boiling my water, putting it in the french press, letting it sit for five minutes, putting that coffee into my mug, cleaning out the french press, putting the coffee back into the mug, adding my MCT oil powder, I also add collagen, and I also add a little bit of Perfect Keto Keto Collagen. The reason I add that is it has stevia and a little bit of cacao powder in there so it just naturally makes the coffee better. Then I just froth it up with the actual french press and then I just drink that. That usually sets the stage for me making “better choices” all day. I find that when I have that fatty drink in the morning, I just naturally gravitate to higher fat foods. When I do feel like a carb up, which is usually once a week or so, I have a carb up. I don’t stress about it much. I just set the intention of eating low carb, high fat. When I do test my ketones, which is quite rarely, I’m always on point. I really just go off how I feel. If I start craving carbohydrates, I know I probably overdid it. Or, if my brain gets a little bit foggy, I know I probably overdid it. So, I just kind of go off how I feel. As for falling off the wagon after vacation, I don’t see that there is a wagon. I think when we start to think of there being a wagon, that’s when we can run into issues. When I’m on vacation, sometimes it’s harder to find keto options. Oftentimes when I get back from vacation, I find I’m always fat deprived. But I think because I don’t think there’s a wagon, and because I honor my body and just try to make the best choices, it’s less than an all out binge fest when I’m on vacation because I’m not thinking, “Oh, my gosh, all these tempting foods. I can’t have any of them.” And when I get back from vacation it’s always like, “Oh, my gosh, I didn’t have enough fat. I can’t wait to get home to eat more fat.” So I think it’s all in the way that you structure your eating style, and that’s why I choose not to track. So, that was kind of the moment I decided to step forward. What helped me facilitate that change was surrounding myself with people of the same mindset. So I stopped following keto people that were tracking macros and being all about macro life. I started following a lot of body positive people, and I just started going off of how I felt. If I was hungry, I was going to eat. If I wasn’t hungry, I wasn’t going to eat. And instead of tracking my food, I wrote down everything that I was eating. About two weeks following that day, I would put it in a tracker, and see how I did; that way I could see my macros, and what are they, and how much am I eating? I found that there were days, guys, when I ate like 5,000 calories in a day, but my carbs kind of stayed the same, like my macros were pretty on point. I think macro counting and tracking can be really helpful when you first get going with a ketogenic diet, but once you have a good sense of what a protein, fat, and carb is, you really don’t need to track every single thing. I think, oftentimes, it can be detrimental to your progress. I never really looked up strategies, like reverse dieting or things like that, I just went off how my body felt and did those things and was patient. Question Number 3: Adjusting to Keto. How long did it take you to know that your body was happy with this lifestyle? Twenty days. I talk about it a lot in The Keto Beginning. Basically, there was a day when I hiked a mountain, I went standup paddle boarding, and I got home, and all I wanted was fat for dinner. And that’s when I knew that I was on to something, and that’s when I knew I wasn’t going back to my high carb vegan type of lifestyle. Question Number 4: Food Intolerance. What are your experiences with food intolerances? How much time do you have? Basically, I am sensitive to basically, all things, including most humans. No, I’m kidding. I have a lot of food intolerances. They started when I was quite young; I was told I had a dairy allergy probably when I was six years old, but I refused to believe that when I turned into a teenager and ate a lot of cheese and a ton of gluten. I was diagnosed with celiac disease, but then told maybe I didn’t have it later. I don’t know if the doctor was crazy. I tried to eat gluten again, my stomach hurt like crazy, never went back. I determined that grains were a problem with my psoriasis, and really inflamed my body, so I cut those out. I don’t eat dairy anymore. I find that I do better on more of an autoimmune protocol, so I don’t do a lot of nuts or seeds. I can get away with sesame seeds, hemp seeds, but that’s about it, and I kind of rotate them a little bit. My body is really sensitive to food that I continue to eat, so I can’t really do eggs anymore because I ate too many eggs when I started keto. I also can’t do a ton of mayo because of the eggs, which is totally unfortunate, flax seed. So, my experience is that I always need to rotate my food, otherwise I will get sensitive to it. I understand that I still have a lot of gut imbalance that I need to work through because of my history with an eating disorder, and just being really, really restrictive with my body. So, that’s going to take time. Question Number 5: Motivation. What motivates you to stick to the plan? If you ever lost your motivation, how did you get it back? I think motivation and willpower is complete BS. I don’t know … it’s funny. I think that motivation works when you’re doing something that feels good and you actually want to do. Here’s what I mean: when I was a marathon individual, I was a triathlete, I was doing marathons, I was training all the time. If I took a moment to ask myself in that time, and I definitely did a bunch of times, “Am I happy? Do I like doing this?” The answer was always, “No.” But I kept doing it because I thought I needed to do it, and at that time I had a lot of willpower built up. I wasn’t totally sure of the world yet, which I still am not, but I feel like I’ve learned a lot in the last couple of years about myself and my body and where I fit in the world. So my motivation now isn’t really driven by any external forces. I am motivated to just feel good and honor my body, and how that looks on Billy Bob is going to be different than what Sue thinks about that. How I honor my body and how I feel good is going to change day to day, and that’s what motivates me, and that’s how I “stay on track” because I just want to feel good. But, heck yeah, there are times where I totally screw up. I think I shared this on Instagram a little while ago. I had had a carb up, I’d done my carb up for the night, and all of a sudden I found myself eating popcorn that had chocolate chips and raisins on it. I’m sitting in front of the TV eating my feelings because I was stressed about something. Instead of getting all torn up about it, and calling myself fat and horrible and stupid and all these words that I use that are hate-based, I just said, “Well, that happened, and it was probably because of XYZ emotion.” And I move on, yeah. Number 6: How did you turn the keto diet into a sustainable lifestyle? How do you keto without feeling restricted and like you’re on a diet? I think the big piece was incorporating carb ups into my ketogenic diet. I honestly don’t think that I could be keto right now if it weren’t for those carb ups. I talk about carb ups a lot in my program, Fat Fueled. But when we have carbs at night, what we’re basically doing is we’re avoiding brain fog. We’re also allowing ourselves to eat the carbs when we want to, like when we’re out with friends or when it’s our birthday or when we feel like popcorn. So by eating those carbs at night, we’re avoiding the brain fog that we would have if we had the carbs in the morning or at lunch, we are going to eliminate the need to binge because we feel a lot freer with our choices. We increase our insulin sensitivity, we have better sleep. So if you’re not sure what carbs are, carb ups, I’ll include a link in the show notes about what a carb up is, and how you can get in on the party. I think this really ties in line with maintaining keto long term. For me, it’s been don’t go crazy about food. Don’t surround yourself with people that are also crazy about food and macros or think that you need to track your ketones in order to be successful. Just have a good time and do things that make you feel good. If things don’t make you feel good, don’t do them. Number 7: I’d like to know more details about how you regained your menstrual cycles, specifically what worked for you and what didn’t work? Awesome. So if you guys are new to Healthful Pursuit, I’ll just let you guys know, in 2007 I studied nutrition and went off birth control. I did get my period back after six years of not having a period. Yes, I actually went that long. I decided to do something about it. I went on hormone replacement therapy, and that made me gain a lot of weight. Note: I did not say bioidentical hormone replacement therapy. Totally different. Went on hormone replacement therapy, made me gain a bunch of weight, which is how I found keto. After six months of eating keto and feeling sort of miserable, but looking really good, I decided to adjust my ketogenic diet, which is how I landed on the fat fueled approach, which is what I share in my program, Fat Fueled, which I’ll also include a link to in the show notes. How I got to that fat fueled approach was really deciding that my life was better than hanging out in my pantry counting calories on MyFitnessPal. So that process of not tracking, of eating when I was hungry, of not forcing myself to fast, those were the big pieces that got my period back. One of the biggest parts to getting my period back was I stopped intermittent fasting on a ketogenic diet. So when I was hungry in the morning, I ate. When I was hungry at 2 o’clock in the morning. I ate. If I was hungry at 9 pm, and it was outside of my eating window, I ate. The other one is eating enough fat and eating enough. So when I was hungry, I ate stuff. A lot of stuff. A lot of fatty stuff. And then, the other one was that I stopped working out. I stopped running. I stopped cycling. I stopping lifting. I stopped all the things. I gave myself six months for that. After six months, when hormones were a lot better, then I gave myself nine months. Then my period came back. When I went to the gym recently, about six months ago I started going to the gym again, and my hormones got really bad. I missed my period, so now I just do a ton of walking. I love walking. Since we’ve been here at the ocean, I’ve been probably been walking about two hours a day. I do yoga in the morning, I stretch, I sit in front of my sauna – more information coming about how I’m able to be in a sauna in an RV, I’ll tell you about that. But those are some things that worked. The things that didn’t work is hormone replacement therapy, eating all of the carbs didn’t help, being vegan didn’t help, counting calories didn’t help, working out still didn’t help. So I hope that was helpful. Number 8: What is the most unexpected benefit of living ketogenic that you have seen in your life? I really wasn’t expecting to be a happier person, honestly. I would say that I’m momentously more happy than I was when I was eating all the carbs and the sugar. I think because it has just given me more brain space, so, that would be my answer. We’ll get right back to your questions and my answers after this message from one of our podcast partners. Dipping down into the mindfulness practice, and how I practice mindfulness. Question Number 9: What is the thing you do every day to stay balanced and happy? I mentioned this a little bit ago, I really love waking up and stretching, even if it’s just in bed. I like stretching. I also love reading; I just started up reading again, it’s been a couple of months since I’ve started, and I love it so much I just can’t even. So I usually stretch and read, sometimes at the same time. I always give Kevin a kiss in the morning, even if I’m in a rush. I always like saying hello to each of our dogs, we have three. So those are a couple of things I do right when I wake up. I really like having that morning practice. I always, always wash my face, brush my teeth, do my hair, put on makeup before I do anything else. I just feel like that’s important and it gives me time to just spend with myself. I also really enjoy renting hotel rooms by myself and working. That’s another thing that I enjoy, just like this quiet space where I can create. It doesn’t have to be renting a hotel. I just live in a 180 square foot home, so there’s not a lot of space to make recipes and stuff. But I find that alone time is really beneficial for me and helps me stay balanced. Another thing is learning how to say no, that’s something that I think is going to be quite powerful in 2018 for me, saying no to things. So I hope that that was helpful. Number 10: How do you not compare yourself to others and stay motivated when you don’t see the results when you expect? Ugh, yeah, I’ve been there. I think for me, right now, I don’t really have time to compare myself to others. I am go, go, go 24/7, and when I have a moment to sit down, the last thing I’m thinking about is picking up my phone to compare myself to others. I know that when I was really, really unhappy, and still had a full-time job knowing that I wasn’t fulfilled at that job, I called it the 3 pm compare hour. And at 3 p.m. every day I would end up on, I don’t know, what was big back then? Facebook, I think, or just cruising the internet seeing how all these other bloggers were working full-time, and I couldn’t because I wasn’t making any money, and how was I supposed to because I didn’t even know what I was doing, blah, blah, blah. So, if you’re comparing yourselves to others, it’s a really good indication that what you’re doing isn’t making you happy and something needs to adjust. And it might not be moving to India … yeah, that happened … and then quitting your job, it might be something smaller like going for more walks, or telling your significant other that you need more time with them, or that you need more communication from them. So there’s a couple of pieces to that, but I think really it’s just a matter of being happy with your body and happy with yourself. When you don’t get the results you expect, it’s not the end of the world. I think a lot of the time we get so wrapped up in our goals that we forget the fact that it’s pretty amazing that we’re just alive and breathing, and that we have people that love us. So sometimes it’s just a matter of taking a step back and looking at the big picture. Number 11: Let’s chat more about the way you use and support coaching and mindfulness as part of your body healing process. Oh, okay. More about the way you use and support coaching and mindfulness. Maybe this is the wrong answer, but I think sometimes we are so in our heads, and we think all these practices need to happen in a day to be happy and healthy and whole. I don’t consider myself to be any better than anyone else at all. I still have struggles and stuff, I just don’t really care when things don’t happen or somebody comes out with the ten steps to better support mindfulness. I’m like, “Dude, I ain’t got time for 10 steps. Give me one step.” So I think the big thing is just the morning practice, saying no to things, just surrounding myself with cool people and cool things that I like to do. Number 12: How did you know when found your happy place when you were developing your fat fueled profiles? There had to be a “Yes, that’s me!” moment, and when you started to feel better there had to be an aha, or two. Another aha moment was when I got inspired to go to India for an open amount of time, and I spent a lot of time there. I got back. I quit my job. We moved across the country. That was an aha moment of, “Wait a minute. I don’t … Where is my life going?” And the other aha moment, I would definitely have to say, was when I decided that I didn’t want to track my macros or be crazy around food anymore. I think the aha moments are just when you get this feeling in your belly and it’s like this butterfly feeling, and you’re kind of nervous, and also terrified, but in your chest it doesn’t feel restricted. You’re not terrified in the sense of your chest feeling tight. You’re terrified in the sense of your chest feeling light and open and ready for experience. I think that is what defines an aha moment versus an “Ehhh, I don’t know. Probably shouldn’t do that,” moment. So when Kevin and I decided to sell everything and move into an RV, when we were talking about it, although I was really nervous and really, really scared, my chest felt really open and expansive. So I use the chest as a really good way of determining what feels right for me. Hey, maybe that’s why I chose to get a chest tattoo. I use the chest a lot as like an energetic center to understanding what’s good or bad or things like that for me. So if I’m feeling open and expansive in the chest and ready to take it on, that’s aha moment; and if I’m feeling really tight or constricted, then that’s really not so awesome. Question Number 13: Where do you see yourself in 10 to 25 years? Whoa, that is a big, loaded question. If you know me, you know that I am not good at planning. I can tell you where I’ll be in the next two weeks. I think, for so long, I cared so much about my life plan and dream boards and things that it started to stress me out beyond anything. So now, it’s just like I hope that in 10 to 25 years I am really happy, surrounded by love; love with my body, love with others, love for my dogs, if we still have dogs, just happy, I guess. Maybe that’s a silly answer, but as long as I’m happy and I feel good, I really don’t care about anything else. Part of this question is: Do you ever foresee a time when keto will not be beneficial for you? If so, how will you know and what will you do? As you grow older, or your physiology changes, will keto still be the answer? I can’t really answer that. When I was vegan, I thought vegan was going to be the thing forever, and I couldn’t see an end point. I think it’s hard for us to see an end point in things when we’re not there mentally or spiritually or physically or anything. I’m not the type of person to stay on something that’s not benefiting me, so if it doesn’t benefit me, I’ll tell you guys, and we’ll change it. That was the same thing, when I was blogging back in 2010 to 2014, when I decided to do keto, I was like, oh my gosh, I’m going to lose all my followers because I’m not doing this whole food based vegan thing anymore. I was really scared, but I knew that I had to be true to myself, and that’s what I did and it all worked out. So I don’t know whether keto will be good for me in 5 or 10 or 25 years. I’ll just roll with it, and constantly change as I go. Question Number 14: With everything you’ve learned around this journey, what is the one thing you feel you know the least about, and are actively seeking knowledge about? I feel like I don’t know enough about medicine and medical applications of the ketogenic diet, and just more of the science, like deep into the science. I’m actively seeking knowledge about it, very much so, with a brand new project that I’m working on for 2018, and you guys are going to love it, so stay tuned. Number 15: What’s the one message you are trying to get across? What’s the legacy you want to leave behind? Whoa, legacy. Okay. There are two parts to this question. What’s the one message that you are trying to get across? Basically, the deepest message is, “Girl, you’ve got to love your body. You’ve got to love yourself.” That would probably be the deepest message, and that’s what I would say to my best friend. “Girl, you’ve got to love yourself. You’ve just got to let it go.” I think that’s one of the deepest messages of Healthful Pursuit and then, the application of how you do it is maybe a ketogenic diet. It’s maybe learning to eat intuitively, and that’s why I give the tools that I give so you guys can figure out what works for you, and that’s why I give all sorts of information because you may find that some things work better than others, and that’s cool. As for the legacy I want to leave behind, I don’t really think about that. Perhaps I should. Kevin and I decided quite a long time ago that we don’t want children, and that’s just not the path for us. So I’ve always imagined that the energy that I would have spent in children, we definitely spend with our work. I think the number one thing, and Kevin and I talk about this quite often, is just we just want to help people. So if there’s things that we’re experiencing that might help someone else, or maybe somebody I met says something that I think that information will help somebody else, I just want to be the person that allows for that information to be shared. I guess if I were to die tomorrow, and people are talking about the work that I did on this planet, I would hope that people would say that I was able to help them, really. That’s all I really care about, so that they can be happy and healthy, and feel good about life. Okay, let’s get to the fun stuff because I’ve been waiting like 30 minutes to get to these questions. I’ve been told they’re pretty great. Question Number 16: How did you know you wanted to be a blogger? And I would say that I’ve pretty much defined that job for myself, and that’s quite cool. I was an expediter when I was going through school, which is basically quality assurance for the kitchen at a restaurant, I would make sure all the dishes went out properly, that everything was prepared right, it looked good. So that’s really helped me with my food preparation skills, and knowing how to structure a plate so that it looks clean and nice. Kevin is a photographer, or studied photography, and I had a couple of friends in school that did a lot of photography. I was an art major as well, that’s how I learned a lot to do with the photography piece of my job. With the marketing piece, I never went to school for marketing. I ended up working at a call center when I was younger. I worked myself up to the supervisor of a call center, and then moved over to marketing, and worked myself up to a program manager, and managed a whole bunch of people in the marketing group. I just moved up in the ranks of my jobs, learning all that I can learn, watching a bunch of YouTube videos. When I learned what a blogger was I said, “That’s pretty cool. I want to start a blog.” And now, I wouldn’t consider myself a blogger, I would say I’m more so a writer than anything, or creator, because I create all sorts of things. I just want to create things that ultimately give you the tools to be able to do what you want to do. But I feel like I’ve been in training for this specific role for a really long time, and that’s how I know that it was meant to be. Question 17: I would love to know the stories behind each of your tattoos. Okay. Everyone asks, this is probably the number one question of this entire episode. I get this question so much, so I’m going to try not to forget any because I do have a lot of tattoos. I’ll start from the feet and go up. So, I have two tattoos on my feet because I got two feet. The first tattoo is one of a bunny. It’s a bunny because my dad’s nickname for me is Bunny. Basically, when I was a kid, my mom bought me this bunny costume. My dad thought it was the coolest thing, and every time he saw me he would get really excited and the name just stuck; so much so that when I worked with my dad, he still called me Bunny in the office. It was quite mortifying. I was a young kid, and he called me Bunny, and there were cute boys who worked there, and it was just horrible. But, even to this day, I don’t think he ever calls me Leanne. The other tattoo on my other foot is of a cow, and it’s a cow because I have a thing for cows. It started when I was little. My parents and my sister and I used to go on summer vacation to places that looked pretty close. We didn’t have a lot of money so they were simple vacations. I didn’t go on a plane until I was almost 20. I had never been outside of Canada until I was 20-something, so it was very close proximity vacations. On those vacations, there wasn’t a lot to do. There were no TVs in cars back then. It’s either you look out the window, or you read a book, or you listen to an audio book on cassette. That was it. So my sister and I had a game that we liked to play called count the Jersey cows. I thought it was the coolest thing. She would take one window on her side, and I would take the other, and we would count cows on the way to vacation. Well, she’s a lot younger than me and not as bright as this one because I’m older. We used to count, and whoever had the higher number won. Well, I would just randomly pick a number that was higher than hers, and would always make her say her number first. So she would say, “I count 615 cows.” I’d be like, “Oh, my gosh. I counted 1,000.” So, that’s where the cows came from. I also have a tattoo on my stomach. It says, “Beautiful Disaster.” It’s a 311 song that I fell in love with as I was overcoming my experience with an eating disorder. So I decided to get that tattoo on my stomach to remind me of that song and what it means to me. I have a killer lobster on one of my ribs. It’s a pretty long story, basically, the gist of it was, we were in Maine, and I was eating lobster. I was, I would say … I can’t even remember how old I was, I was pretty old, and we were eating lobster. My mom goes, “Honey, where did you put the lobster stomach?” And I’m like, “Lobster stomach? What?” My whole plate was cleaned. And she’s like, “Oh, you ate the stomach, but don’t worry, it’s a delicacy in some countries.” And then, I threw up all over myself. And now I’m terrified of crustaceans, I can’t even see people eat them, or touch them, or when we go scuba diving, I can’t even. So … even talking about it makes me want to gag. I also have a tattoo on my back. It’s of a wave with music notes. It was my very first tattoo and I hate it a lot, because the tattoo artist that drew it didn’t really give me what I wanted, but I didn’t want to hurt his feelings so I had him tattoo me anyways, which life lesson on that. But it says, “Life is music. Music is love. Love is life.” So, there’s that. I also have music notes on the back of my ear. I have a chest tattoo if you haven’t seen it already, it’s kind of in plain sight. It’s of sunflowers, I used to play under a batch of sunflowers in a garden when I was growing up, I used to play Barbies, and all the things. When I learned how to sew and craft, I loved sunflowers, and I made sunflower quilts and sunflower hats and sunflower … I was just obsessed with sunflowers as a kid. I also have wrist tattoos that say “True Self” on it, and I have a tattoo on the back of my neck, but I can’t remember what it’s of. I never see it. What is it of? Oh, it says, “Just Be,” I think that’s it. I’ve always dreamt about getting more, I really want sleeves one day. I just haven’t found the time or interest yet. I think about them, but not enough to care right now. Question Number 18: What is your absolute, all-time favorite keto meal? How do you make it? What about your favorite easy recipes to stay on track? My absolute all-time favorite meal. I mean it changes. The thing about writing for a living and making recipes for a living is that you don’t really have time to make the same thing twice. You just don’t, you can never make the same thing twice. And so, for right now, I would say my favorite keto meal, that I just made, is this bacon grease tomato sauce. Basically, it’s just this tomato sauce with green onions and leftover bacon grease. You just whisk it until it incorporates and gets all yummy. I serve that with some sort of grain free bread. You can make it with almond flour or sunflower seed or basically any flour, and it’s usually about a cup of flour with an egg that’s cooked, I can handle cooked eggs sometimes. With pepper and salt and you just cook it like you would bread. Then you cut it up and you dip the bread in the tomato sauce that’s filled with fat and delicious. Then I put some sort of meat or vegetable on top of it, almost like cheese and crackers, but different. Usually I use a paleovalley grass-fed beef stick because … delicious. Kevin, he’s eating cheese now, so he puts cheese on his. We’ve put like roasted vegetables on there. We’ve done raw vegetables. Yeah, I would have to say that’s probably my favorite keto thing right now, because it’s super easy and delicious and could be a snack but could also be considered dinner. I’m the type of person right now that I don’t like having big meals. I’ve really fallen in love with smaller meals, and maybe that’s because I’m not eating as much, I’m not sure. I just like snacks that are meals. So, instead of having or preparing a big meal, I’ll just make a snack plate and eat that instead, with all sorts of different types of things. It could be a thing that I’m going through right now, nobody knows, I just kind of go with it, and see where it takes me. I would have to say that’s probably my favorite. Oh, I also have a favorite meal of grated cauliflower with ground beef and nutritional yeast with a little bit of vinegar. I probably eat that at least once a week, I really love that meal. Favorite easy recipes to stay on track … I don’t know. I guess my fatty coffees would be considered one that I use to, not motivate me for the day, but just to set the tone of the day. I find that if I don’t have a fatty coffee, or I go too long without eating, I just don’t make the best choices and I’ll end up picking on things all day instead of actually eating. So my fatty coffee that I described earlier with frothing it with the french press, that’s what I’ve been doing lately. I also like Rocket Fuel Lattes. They’ve just been too much work for me right now. I’d have to say that definitely. And then, for like fat bombs and stuff like that, I don’t really do fat bombs anymore because of the sweeteners. I just felt like I was eating so many of them. If I’m hungry halfway through the day, I really like just a piece of dark chocolate with some coconut butter on it. Super simple. Number 19: Is there one food that you wish you could go into any restaurant or kiosk in a restaurant or an airport and order that isn’t currently available? When I’m at the airport, what do I want? I don’t know. I feel like I can find everything as long as I bring my MCT oil powder with me that’s mixed with some collagen. I also bring some sort of nut butter, seed butter thing. I really like coconut butter. I’m usually pretty good at airports. If I’m at an airport and I’m hungry, and it’s beyond just like getting a coffee to add MCT oil powder to or finding a bar of chocolate that I can put coconut butter on, I usually just get a salad or a burger or a steak or bacon. I mean, it’s not going to be the best quality I guess. But here’s a thought, it’d be really, really cool if grass fed, grass finished meats were more available when I’m traveling because I always get so inflamed after my trips. I have to deal with inflammation for weeks on end until it gets resolved. So I think it’s not necessarily like a meal or keto type of food, it’s just the quality, and it’d be really cool if the quality was better. Question Number 20: Who would you love to share a day in your kitchen with and why? First off, they’d have to be able to fit in a quite small kitchen. Maybe we could use their kitchen, because my kitchen is really tiny. Who would I want to share a day with in my kitchen and why? Well, you don’t know her, but she’s been on the podcast before. Her name is Kristina Vogel and she’s my sister. Since moving into an RV, and living full-time traveling, it’s been really hard on me to not be with her all the time. My sister and I, she’s three years younger … she’s the most amazing being. She’s so kind and generous and thoughtful and just so loving. We used to have a thing called sister days on Thursdays. We would get together and eat all the foods and watch all the TVs and just hang out. So I would have to say, if she could come to my kitchen, and just hang out with me, and we could drink tea and chat and giggle, I would be the most happiest person in the entire world. So I’m sorry it’s nobody very famous, but that wouldn’t be as cool as hanging out with my sister. Number 21: If you could have a keto meal with any one person dead or alive who would it be and why? Could that person’s life be changed by keto if they haven’t already? Okay, does it have to be a famous person? One person dead or alive. Okay, great. I always feel like these questions are for famous people only. But I don’t want to meet famous people. If I could have a keto meal with one person, dead or alive, it would be my grandpa. It would be my grandpa, in his 30s, so I could tell him about keto, and Alzheimer’s, and just educate him on the benefits of keto when it comes to dementia and overall brain health. I hope that maybe that information would help him. He died when I was quite young. He had Alzheimer’s and a whole slew of other things, so I think it would be really, really great to have shared that information with him. I often think, when I found keto and started delving into the benefits, and then I started talking to my sister about it, and my friends about it, and just talking about how beneficial it can be for the brain. I know my sister, especially, and my cousins who are all around the same age, are really interested because we’ve been quite fearful of getting Alzheimer’s. It skips a generation, so anything we can do to benefit our brain is best. I think it would have been really cool to have a conversation with him to just talk about that, and perhaps have my grandmother too because, you know, sometimes it takes two to tango, and if you’re significant other as well as yourself, are on board, it’s a lot easier to get stuff done so If my grandma and grandpa were there I could just school them on all things keto and tell them all the things and load them up with books and maybe things would have been different. But they’re great people and I miss them every day. In fact, the ring that I wear on my right hand is my grandma’s ring, if you’ve ever seen me in videos and stuff. That’s why I have a ring on both ring fingers on separate hands. Everyone always asks me that question, “Why do you have a ring on your left ring finger and your right ring finger?” Well, that’s why. My grandma’s ring is on the right, and Kevin’s lovely rings that he gave me are on the left. So there you have it. We made it through all the questions, I hope you weren’t totally bored, but we get these questions all the time. If you have more, I’d love to answer them. If you think this podcast episode was helpful, great. If not, I’m so sorry, we’ll be back to regular programming next week. This show’s notes and full transcript for today’s episode can be found at HealthfulPursuit.com/podcast/e60. The transcript is added to the post about 3-5 days following the initial air date of this episode. Have a good one. I’ll see you next Sunday. Bye.